Vintage inspired black dress can go well beyond Halloween. Also comes in plus sizes. 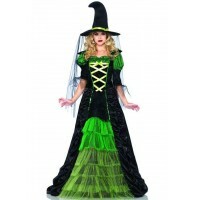 All black Bewitching Witch costume is a vintage inspired dress with sheer sleeves and bodice detail and velvet trim. 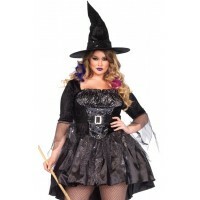 It comes with a wide, shiny patent finish belt and tall black witches hat. Shown with an optional black petticoat, not included. Other items shown sold separately. Item Number: LA-c85238-X | Approximate Size (Inches): 10.00 wide x 2.00 deep x 14.00 high | Approximate Shipping Weight: 2.00 lbs. Red satin stretches to fit most adults (and teens) reaching to the elbow. A great accessor..